Wallace Bluesfest We met last year when you and your partners in crime were playing your "game". Your daughter came over and talked to me this year. I've got a couple of lame but true excuses for not following up right away. Bottom line, severe brain lock. When the set was over you had moved and I looked but couldn't find. I'd really like to talk to you. Just call me "John". Babs You saw me for who I really am. You always did. And you should know that I saw you too. And I see more and more of you every single day. I see the way your eyes light up when you talk about something that you're passionate about. I see the way your mouth curls up on the ends into a shy smile every time you look at me. I see your determination to succeed every day. I see the way you try to act tough, but you're not fooling me. This past year and a half has been the absolute best time of my life and I can't help but fall more in love with you every single day. I'm sorry I don't say it enough, but I love you. Endlessly. Thank you for being a part of my life. Yours and yours only, Angel your old friend..
Ms. Otter Cheers to Ms. Otter at the North YMCA day camp! This is my son's first year at camp and he's been having a lot of separation anxiety. Even though he's not in your group you find us almost every morning and make him excited to be there. You're a wonderful camp counselor, thank you for making his summer fun. Spokane luck! I drove from Peaceful Valley to Rosauers starting with my wallet left on the hood of my car. By the time I realized what I had done, retraced my route searching the roadside, my house and the driveway twice, I just couldn't think of any thing else to do except say goodbye to my money and cancel the credit cards. I sat down to breathe and calm down when there was a knock at the door and a SPD officer handed my friend my wallet. A woman out for a walk picked up, flagged down a passing policeman who was going to turn it in to the property division when he thought he might just stop by my house (listed on the WDL). Saved by the kindness, honesty, thoughtfulness of strangers! Thank you all! In My Dreams Over many years I have dreamt sweet dreams of you on a regular basis. It has been at least 10 years since I last attempted a possible relationship with any one but you, and I am sorry to not be your #1. Friends ARE forever, and it is a tragedy that we seem to have lost the chance to partner up, let alone make time to keep our friendship on the front burner. I certainly believe that you are well worth fighting for, but I dream of you drawing to me, and that both of us could bring down our walls that keep us apart. I am trying to understand, but my heart will never let you go. RE: Law Breakers Thank you for your positive message to lae enforcement about protecting the great city of Spokane. Your sentiment about levying steep fees against law breakers is totally sound. What is amazing is the abject ignorance of those who feel they can justify breaking the law. Perhaps their intelligence is so low, they just don't understand that breaking traffic laws carries penalties if they're caught. Hopefully those who drive closely behind other cars, speed past them, and drive over the speed limit will be targeted and ticketed. Invitation Dear Spokane City Council, you are invited to join me in a 'just imagine' trip up north Monroe. I will drive. We will imagine that the proposed revisions to Monroe are in effect, so we will only be allowed to drive in the right hand lane. Hopefully, we will find ourselves behind a bus. Occasionally, as stop lights and bus pickups/drop-offs demand, you will be directed to observe the traffic piling up behind our conveyance. Sadly, you will have to imagine an emergency vehicle attempting to navigate the center turn lane and the panic of drivers occupying that lane. You will also have to envision frustrated drivers electing to take Post Street ... heads up Post residents. 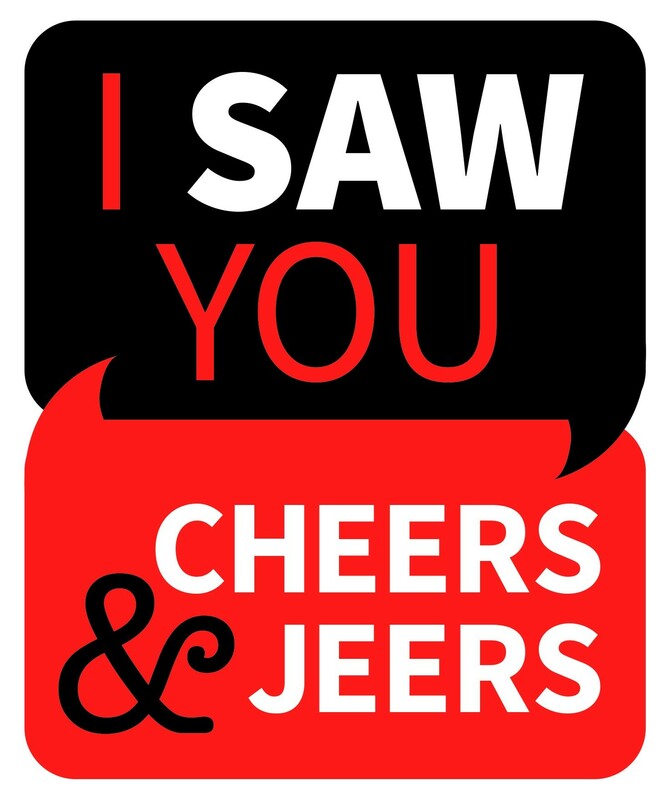 Here comes the 'Cheers' part — I will buy you a beer afterward at Mozey Inn Tavern. Magic Lantern Theater I went and saw a show on Saturday July 15th at this cute and small theater. It was packed in there Popcorn was going and people were standing around waiting for the doors to open up for the show. Only one employee was working and he was hustling around between setting up the movie and handling the rush of customers. I am always pleasantly surprised by his hard work there at the theater. I have never seen anyone else working there and it seems like he is the sole person keeping this very important staple of downtown Spokane alive. Cheers to you Magic Lantern employee. Jeers to myself Shame on me for losing my temper and shouting expletives at the indignant mini Cooper driver traveling West bound on Rowan, Friday July 7th. I had rehearsed my apology to any drivers who were inconvenienced by my traveling outside of the bike lane almost daily for several weeks. That particular stretch of bike lane is loaded with broken glass, so each day as I passed by, I hoped that I'd be able to explain my presence in the "car lane." There was something about this motorists indignant remarks, coupled with his body language that lead to my outburst, although I regret my conduct, I was simply trying to avoid tire/tube damage, not to upset those with him I share the road with.